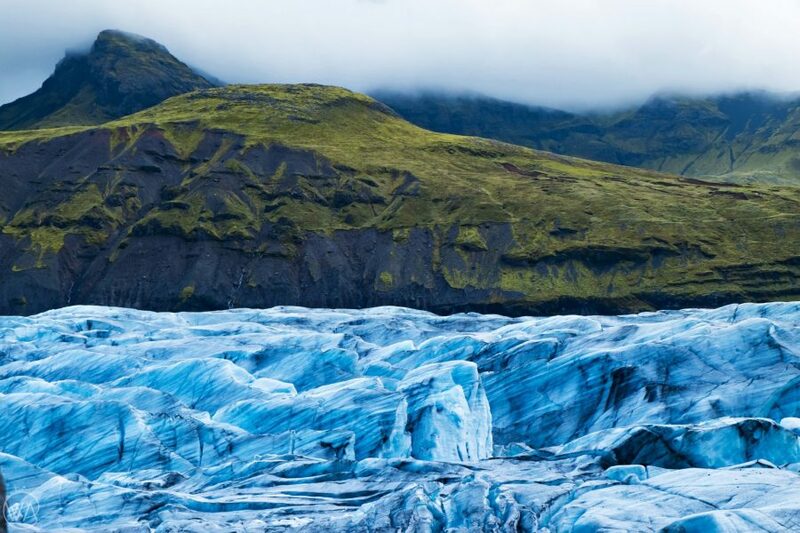 Are you planning a trip to Iceland, a land of ice and fire? I remember the feeling of excitement when I was looking at the Iceland road map and choosing the best Iceland 7 day itinerary for our visit. 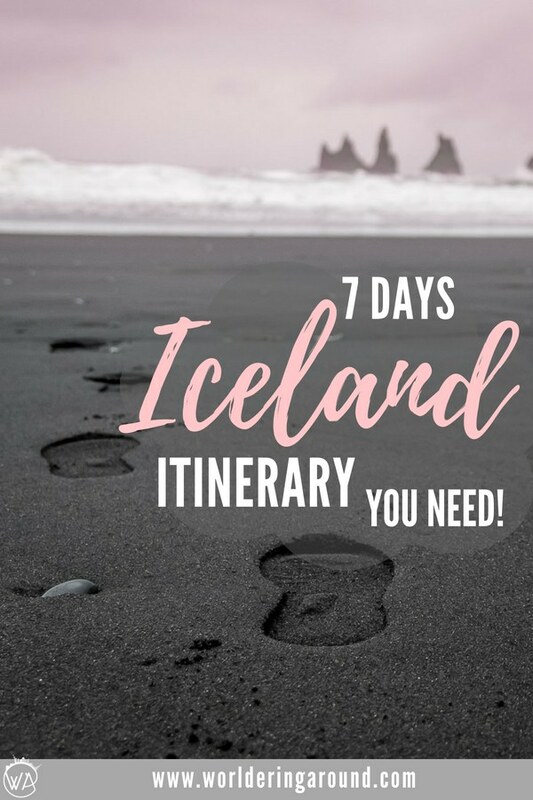 Luckily, you are here, so you have it already done for you 😉 You can make sure that you will have the best 7 days in Iceland. Buckle up and let’s go for a proper Icelandic road trip! Iceland was always one of my dream destinations. It’s wild, it’s different, it’s dramatic. You can go to the mountains, camp close to the waterfalls, look at the simmering earth and watch geysers blowing water high in the air. 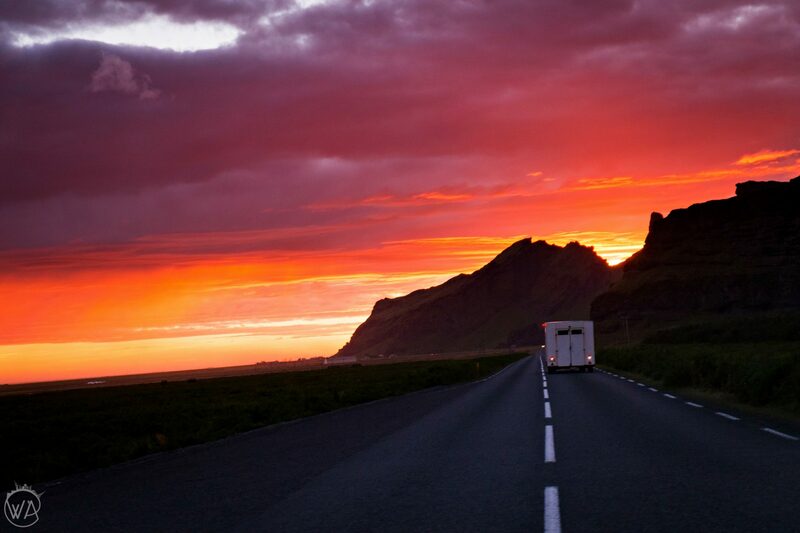 The Icelandic road trip is an experience in itself and the best way of traveling in Iceland. It allows you to truly get to know the land of fire and ice, with all its best sights and hidden gems. It’s true, that Iceland isn’t cheap, but there are also ways of travelling it on the budget. And all that is worth it, when in return you get the mind-blowing Icelandic landscapes, raw nature and interesting culture. We spent a week in Iceland, trying to make the most of our stay. The most famous, and the main road in Iceland is a Ring Road, called Route 1. It stretches for 1300 km and surrounds the whole island. While it is great to take a ring road trip and it is possible to drive the whole Ring Road in 7 days, there is much more to see in Iceland, than it. Your time can be better spend discovering truly astonishing Icelandic attractions rather than driving around Iceland swallowing more and more kilometers trying to see something from the car window. After we booked our tickets and started planning a trip to Iceland, we quickly realized, that a week is not enough for that big island. We decided, there’s no point of driving around the whole island in the Ring Road. It would take us at least 4-5h driving a day, without going out of the main road to see other places in between. Our 1 week in Iceland concentrated on the south and east part of the country. 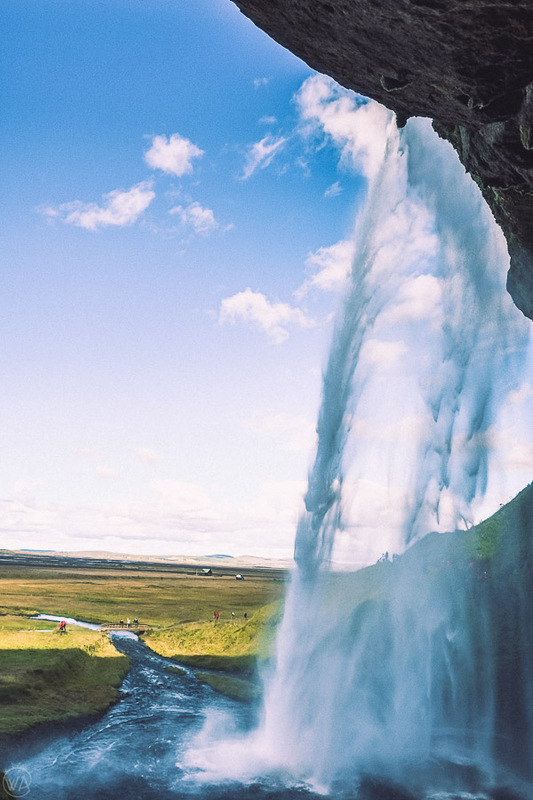 The itinerary is filled with the unlimited Icelandic beauty, letting you explore the best of Icelandic sights, as well as Iceland off the beaten path. Touring Iceland by car is usually the best way to see Iceland and what it has to offer. We visited Iceland in August, which is a great season for driving. You don’t need winter tires as there is no ice and a small 2WD car is enough for normal roads. Since we had only a week, we decided, that most of the places, that we wanted to visit are accessible by 2WD car. Iceland roads are generally good unless you turn off into the smaller “F” roads where you need a 4WD. Renting 4×4 was much more expensive and we probably wouldn’t have much time to make a real use of it. There was only one place, that we wanted to go, that required 4WD – Landmannlaugar, but we left it for the next time. Of course, if we had 4×4, I’m sure we would go more off the beaten track, but then we wouldn’t have time for all the other places, that we wanted to see. Maybe next time, when we might also check some romantic things to do in Iceland for couples. 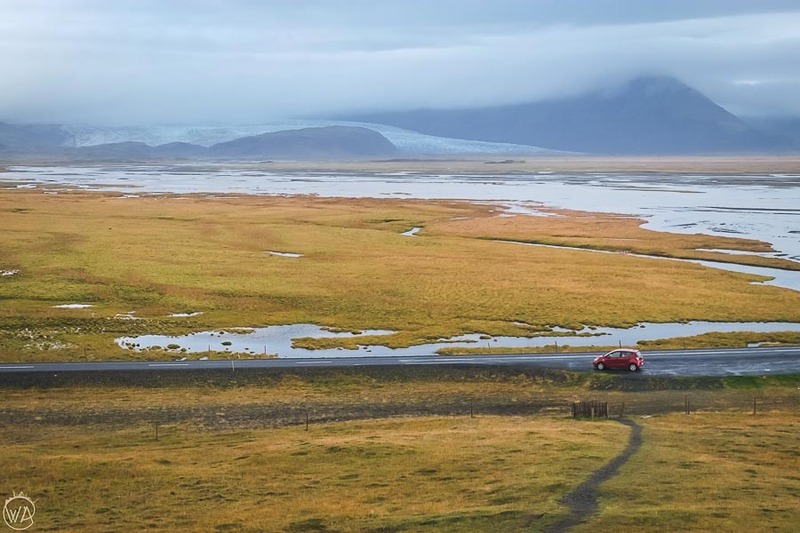 Click to find out more about how to rent a car in Iceland without problems and hefty fees. During the Iceland 7 day itinerary, you will see the active volcanoes, listen to the bubbling hot springs, and walk on the immense lava fields covered with bright green moss. You will be able to catch some sun on the black beaches, admire thousands of years old ice in the blue ice lagoons, and watch wide glaciers flowing down the mountains. The powerful waterfalls will be splashing water drops on your face and dancing northern lights making a memorable show on the black night sky. Are you hooked yet? 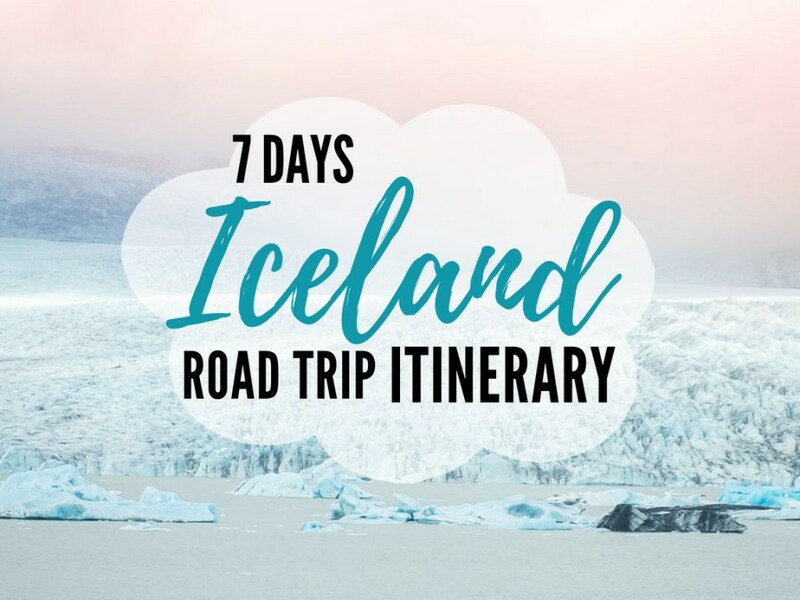 Then keep reading for the ultimate Iceland road trip itinerary in 7 days! During 7 days in Iceland, we drove around 1450 km and visited over 30 places. We wild-camped, stayed on the campsites, slept in the car or in a guest house, hiked, bathed in the wild hot springs, swam in the swimming pools, ate in the local places, cooked on the stove, chased northern lights and drove many types of roads with our small rented car. 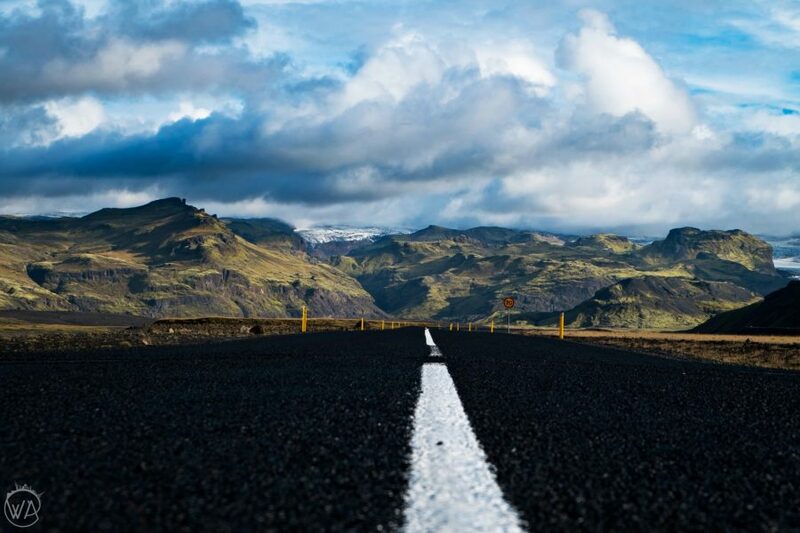 Below, you can find stages of the road trip with Iceland road maps to make your journey planning easier. The main international airport in Iceland is in Keflavik. 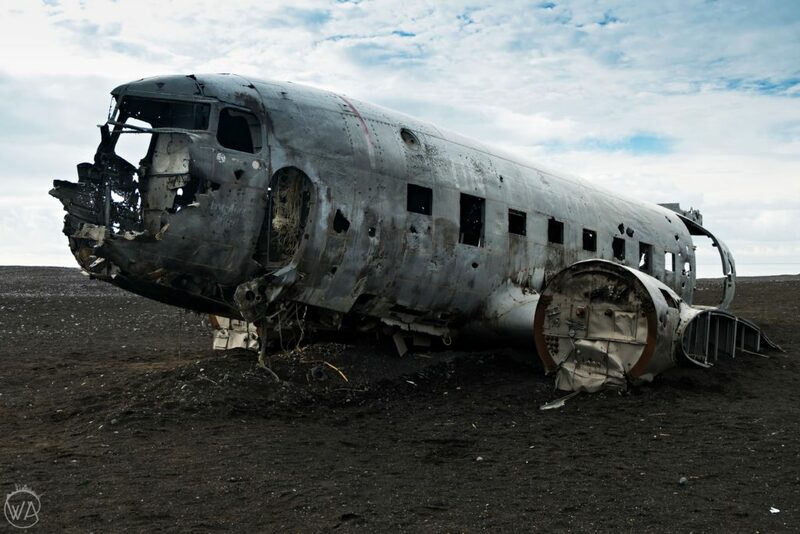 It is highly probable that when you decide to come to Iceland, your flight will land just there. There are many car hire companies to choose from, however, I recommend you to book the car in advance and read how to rent a car in Iceland to avoid any problems. 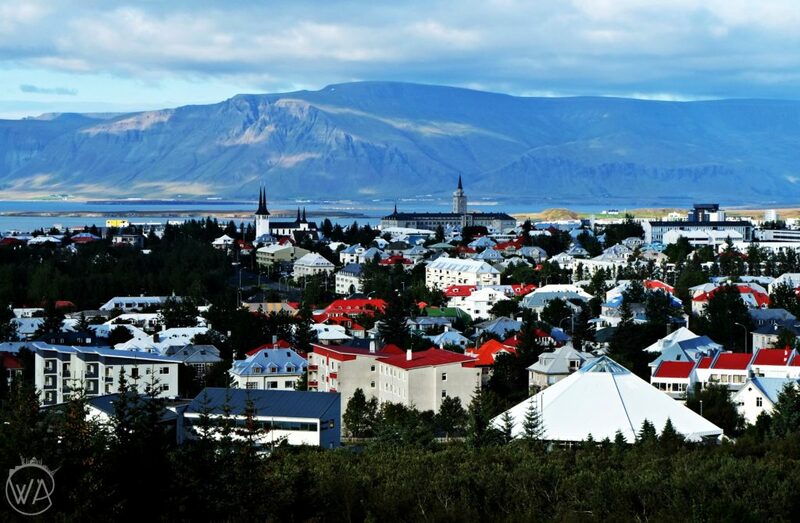 Start the first day of your 7 days in Iceland from visiting the capital of Iceland – Reykjavik. I’m not usually a city girl, and I would jump straight to nature, but Reykjavik is worth a stop. The capital of Iceland with almost half of the Icelandic population is a great place to see a bit of the local way of life. People who you are going to meet during next 7 days on your road trip in Iceland, are most likely going to be tourists, so if you want to talk to (or even just observe) some Icelanders – that’s your chance. Reykjavik has a lively music scene, great pubs and restaurants, where you can try some local delicacies and food which you might want to avoid. Hallgrimskirkja Church – the largest church in Iceland and the most recognizable building in Reykjavik. Hallgrimskirkja Church is a must stop. There are great views from the tower! Reykjavik swimming pools – jump into the fresh water with the locals, relax in one of the geyser hot tubs and connect with the local culture by doing one of the favourite activities of Icelanders. Here is my favourite Reykjavik swimming pool. Art and culture – with several museums, sculptures, and concerts. Don’t miss Harpa Concert Hall, even just to see it from the outside. The building is made from colored glass inspired by the basaltic landscape of Iceland. 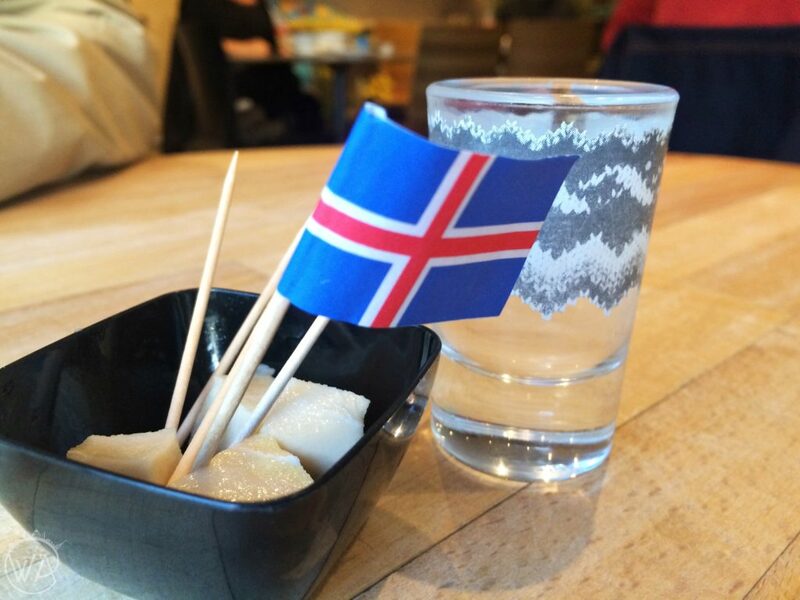 Cafes and restaurants – visit Islenski barinn with a great selection of beers, Café Loki to try traditional Icelandic food (we tried Hakarl), Kaffi Vínyl for tasty vegan food, and Reykjavík Roasters for good coffee. Where to stay in Reykjavik? The Capital-Inn – it’s a hostel located a bit further from Reykjavik downtown but only 15 minutes from the beach. Bunk beds start from £19. Check availability here. Bus Hostel – Located close to the Reykjavik domestic airport and a 20-minute walk to downtown, it offers shared dorm rooms as well as private rooms. Prices start at £29. Check availability here. Mid-range: Skuggi Hotel – located 500 m from Hallgrímskirkja Church, with modern rooms and boutique style hotel. High-end: Black Pearl Apartments Hotel – those luxury apartments are located 300 meters from the Old Harbour in Reykjavik. Wonderful location and stunning place! On the second day of your road trip, wake up early, so you can start driving the famous Golden Circle route before everyone else. The Icelandic Golden Circle is a 300 km loop that starts and finishes in Reykjavik. 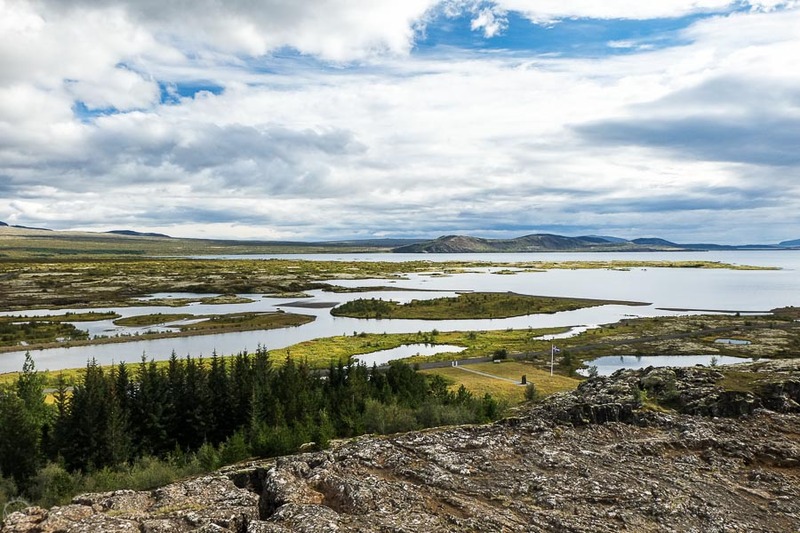 Since you are at the beginning of your 7 days Iceland road trip itinerary, you don’t need to come back to Reykjavik and you can enjoy the nature around you. We stayed in the hot springs area, how cool is that? There is also a nearby campsite where we camped. That’s great when you travel Iceland on a budget. The Þingvellir National Park is a place of great historical, cultural and geological significance and a UNESCO World Heritage Site. The park lies in the valley marking the border between the North American and Eurasian tectonic plates. You can literally see two continental plates at once. Great thing to try is diving or snorkeling in between them! Thingvellir National Park is also a place where the first Icelandic parliament was established in 930 AD and the sessions were held at the site. It’s very nice to just walk around the area and breathe in the history of the earth and humanity. This is a very exciting place to visit during your 7 days in Iceland, especially if you’ve never seen hot springs and geysers before. 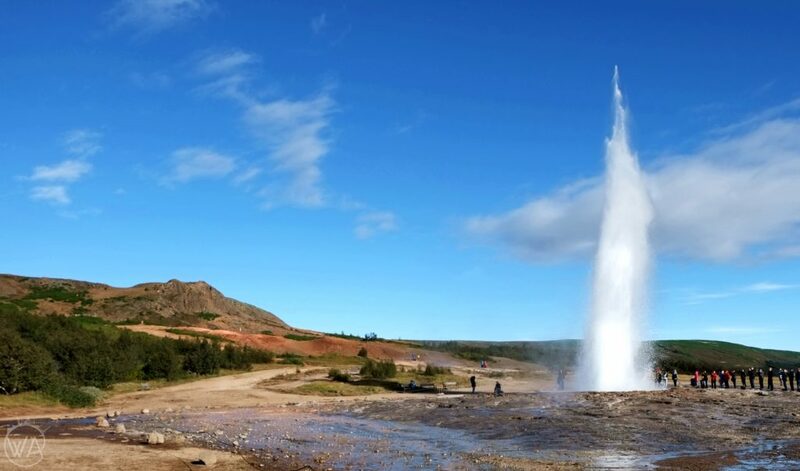 It’s one of the most famous places with the Geysir geyser, which gave the name to all of the other periodically spouting hot springs. The area is located in Haukadalur valley on the slopes of Laugarfjall hill. Apart from Geysir, there is also another hot spring Strokkur located around 50 meters away. It blows water high in the air every 6–10 minutes, so you can be sure to capture it. 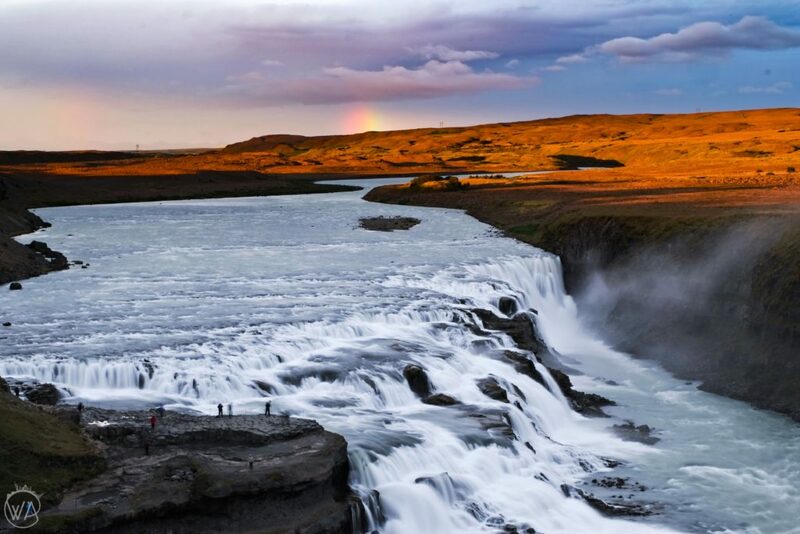 Gullfoss is an iconic waterfall in southwest Iceland. It’s one of the must-see places in Iceland, so make sure to not to skip it. You will be amazed by the masses of water falling down to the rocky river bottom. The waterfall can be seen from above or you can walk down to see it closer. During day 3 of your 7 days Iceland road trip itinerary, you start driving more into the direction from Reykjavik to Vik. You will be able to explore more stunning waterfalls and even jump to the abandoned hot pool in the middle of the mountains. 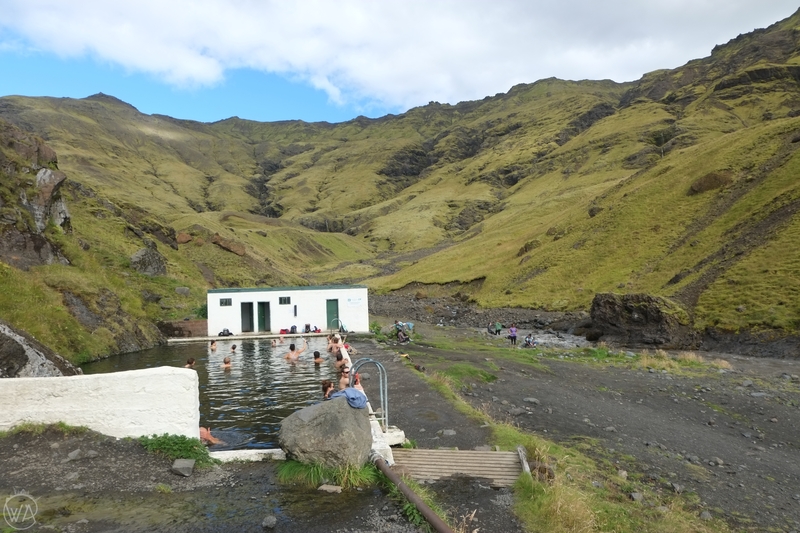 It’s one of the top wild hot springs in Iceland, that we visited. On the way to the waterfall, you will see many Icelandic ponies, they are very friendly and happy for pictures. Urridafoss is a picturesque waterfall located not far from the main road, but not visited by many people. It was totally empty when we were there and we could just listen to the sound of water around. Seljalandsfoss is a special waterfall because you can walk behind it! There is a path starting on one side of a waterfall and finishing on the other. Quite an experience! You can easily spot Seljalandsfoss from the road, as it’s very distinctive and quite tall. There is also another, more hidden waterfall just next to it, called Gljúfrabúi Waterfall. To access it you need to follow the path on the left side from Seljalandsfoss. After 500 m you will see the sign for it. Then you need to cross through into the cave to see the waterfall. Eyjafjallajökull volcano is the Icelandic volcano that erupted in 2010 causing enormous disruptions to the air travel in Europe. In the EyjafjallajökullErupts Visitor Centre, you can visit a small museum about the volcano, its ice cap, and eruptions, as well as see it from the distance. The abandoned pool is called one of the hidden gems in Iceland, although it’s getting more and more popular, so not so much hidden anymore ;). Still highly recommended, though! 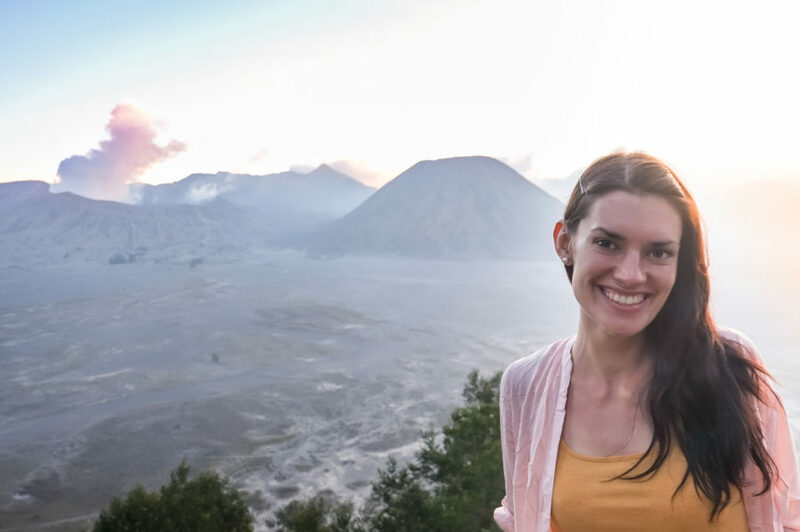 When we were there, there were some people, but we could still enjoy the peace of the surrounding mountains and the warm waters of the hot springs. To get there you need to hike for 20 minutes from the car park. More cool Icelandic hot pools here. It’s a tall and really stunning waterfall that falls from the cliffs remaining from the former coastline. It’s one of the biggest waterfalls in Iceland and you can feel it’s power. You can come close to it, but beware of the water spray, you will be soaked! I recommend some good waterproof jacket for times like this and for Icelandic rain. Where to stay? We camped in the Skógafoss campsite. 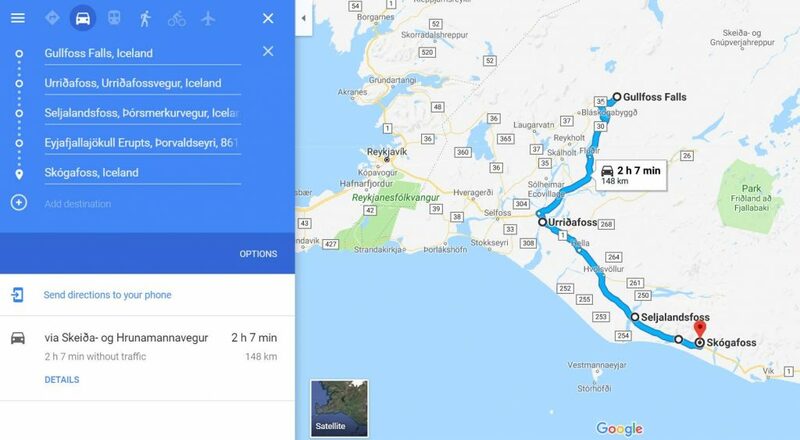 During your 4th day of the 7 days Iceland road trip, you will need to drive a bit more, still following the Ring Road from Reykjavik to Vik with a few turns on the way. Solheimajokull is a glacier in Iceland, located in between the volcanoes Katla and Eijafjallajökkull. It’s easily accessible from the Ring Road and great for the glacier tours. It also makes a great impression even from the distance! A crash site of DC-3 plane is now a popular tourist attraction in Iceland. 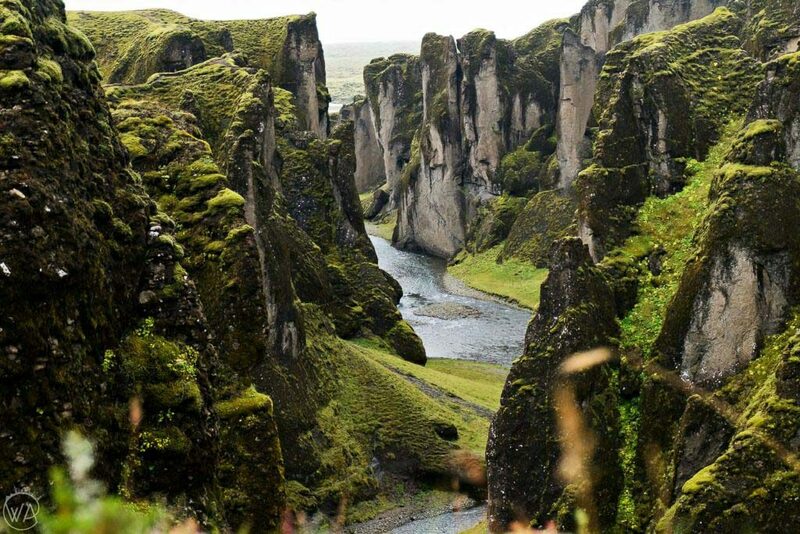 It’s quite a cool place to see, so I would still make it there during your 7 days in Iceland road trip itinerary. The only problem is that you need to walk 4 km one way to the plane through the black desert. Once you get to the site, it looks a bit surreal. I wouldn’t probably go back, but it’s cool to see it once! The way to the plane is marked by yellow poles, so you can’t miss it. The area of Dyrhólaey is stunning and really worth a longer visit. There is a famous rock arch and in the summer many birds. Due to the bird breeding season access might be limited, so keep it in mind. To get there, just turn right from the Ring Road into road 2018. Reynisfjara beach is probably the most famous one in Iceland. 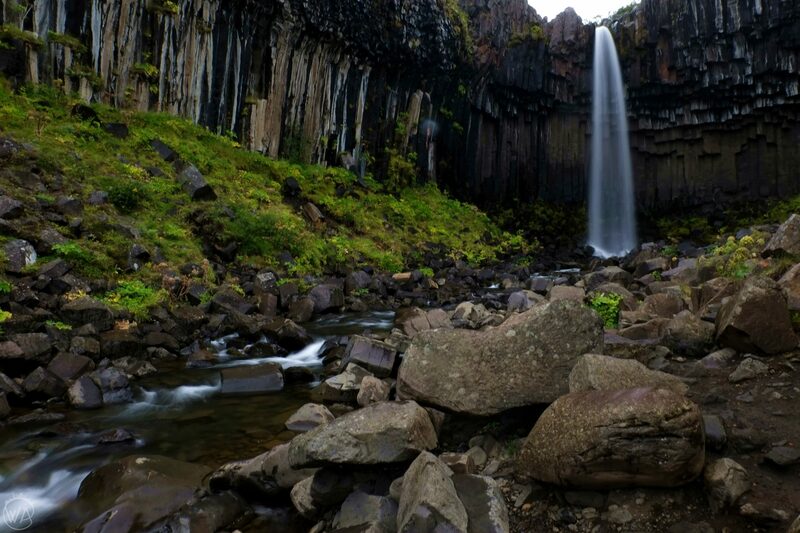 The pitch black sand and basaltic columns creating a big wall look truly spectacular. 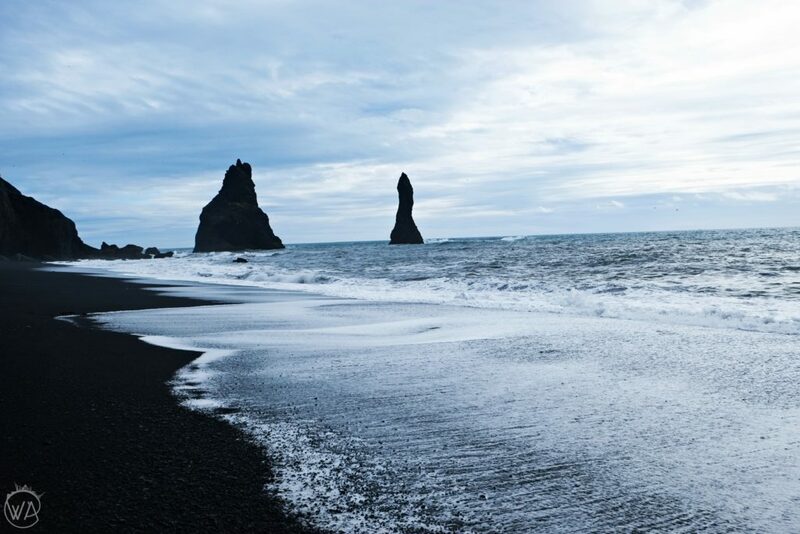 In the sea, you can see the dramatic looking sea stacks called Reynisdrangar. The waves on the Reynisfjara beach are very strong and aggressive, so please be careful and don’t come to close to the water. The black beach in Vik is located at the end of the town, near the petrol station. We had amazing Icelandic food at the station – the lamb stew is the best and reasonably priced. It’s a good place to try some traditional Icelandic food. At this point, you can decide to either stay in Vik for the night or drive further to Skaftafell park. 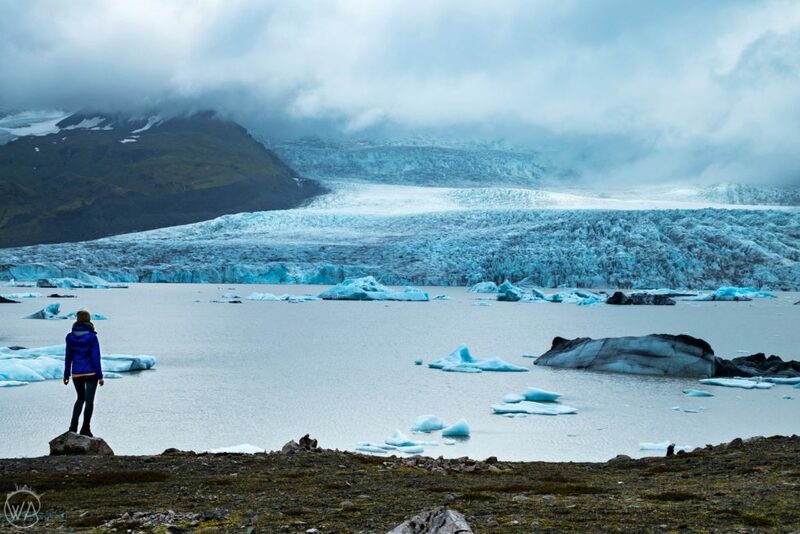 If you plan on doing some glacier activities in Skaftafell and you haven’t booked before, I recommend going there a day earlier to check if there are any spaces. There might not be, so it’s the best to book online first. We finished visiting Vik and nearby areas quite early in the afternoon, so we decided to make it to Skaftafell Park the same day. The Alpine-like landscape with the remarks from volcanoes, glaciers and rivers. Trips to the glacier are very popular and there are many other activities that will keep you busy. If you arrive in the evening, like us, you can still do the shortest hike to the glacier front. You will find useful information in the tourist office. Where to stay in Vik? We camped inside the Skaftafell park. You can start the 5th day of your Iceland road trip with a hike in Skaftafell wilderness area, a part of the Vatnajökull National Park. 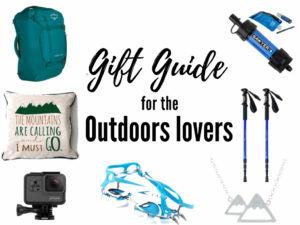 There are many amazing opportunities for all the outdoor lovers, including the glacier walks or easier hikes to the waterfalls. Just remember to go for a glacier walk with a proper guide and equipment. You can find some of the good hiking tours here. Another alternative is hiking on many trails in the park. We chose to visit the Svartifoss (Black Falls). It’s a waterfall, that falls down from the basaltic rocks. Fun fact: it was an inspiration to the architect designing the Hallgrimskirkja Church in Reykjavik. 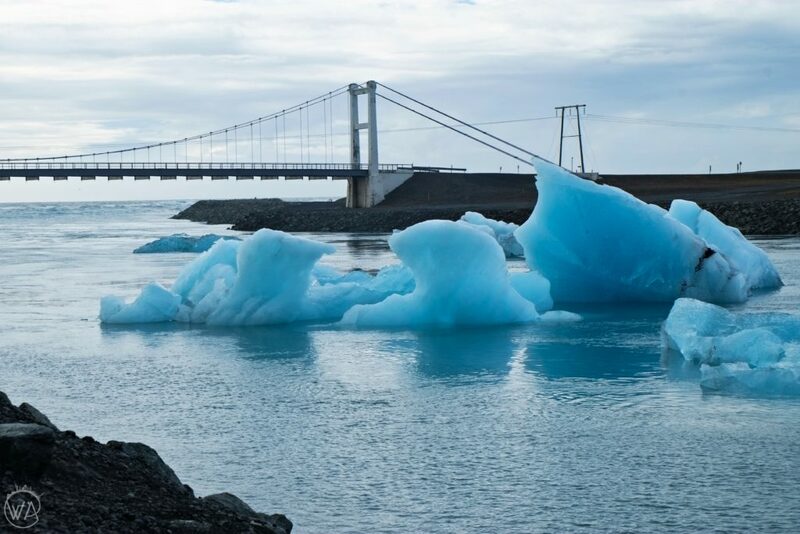 Have you ever seen the pictures from Iceland of the blue ice floating in the water? Or big pieces of ice resting on the black sand beaches? They were probably taken in the Jokulsarlon Glacier Lagoon. The lagoon is one of the surreal places in Iceland and you shouldn’t miss it in your 7 days Iceland road trip itinerary. Especially, because it’s so easily accessible from the road – it’s not possible to miss it. 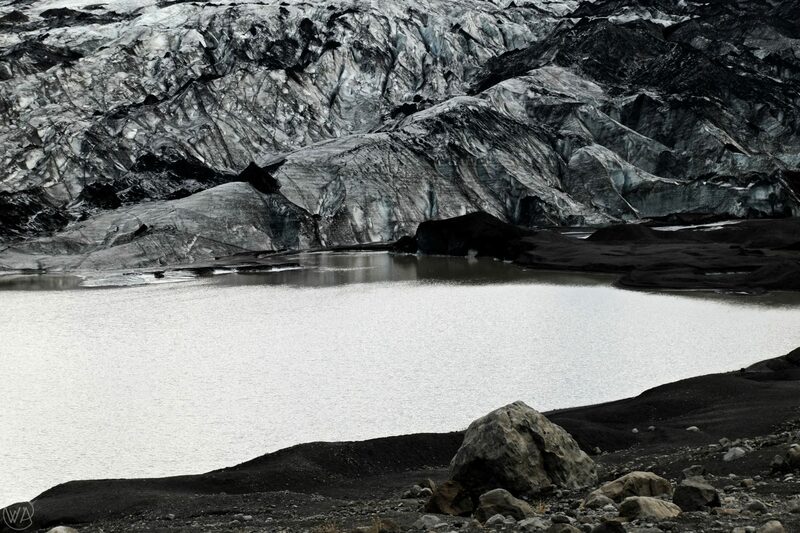 The lagoon is created by the masses of ice from the nearby glacier, breaking up and being floated away by the sea water. Some of these ice particles are then deposited in the nearby beach and look like diamonds against the black sand. Hence the name “Diamond Beach”. The glacier lagoon is located on the left side of the road when coming from Reykjavik to Vik direction and the beach is on the right side. When you go to the Diamond beach you can touch and taste the thousand years old ice. Not very yummy though! There is one very cool thing about Hoffel. You can find there a hot tubs located in the middle of nowhere and overlooking the mountains around. For a small fee, you can enjoy the natural hot spring water and the amazing view. We spent there quite some time, fighting with the bad weather and enjoying the warmth. Höfn would be your furthest stop during this 7 day Iceland itinerary. But you still have a lot left to see during the next 2 days in Iceland. Hofn is a small town, where you can find a shop and a hostel or Airbnb to stay at. Where to stay in Höfn? Find the best hotels in Höfn here! Wait, wait, we’ve just been there yesterday? Why would you repeat something when you just have 7 days in Iceland? Well, the lagoon is on the return way, just by the Ring Road, so if you want you can stop by it one more time. We did. The weather was much better than the previous day! You can also easily skip it if you#ve seen enough. Fun fact though: the lagoon looks different every day because the ice is moving and creating different shapes. Everyone knows about Jokulsarlon Glacier Lagoon, but not everyone knows about another one, located not too far from Jokulsarlon, the hidden Fjallsárlón Iceberg Lagoon. If you want to enjoy the peace without the crowds and be amazed by the masses of ice flowing down the mountains – this is a place to be. One of my favourite glaciers in Iceland, that we didn’t even know we will visit. It’s one of the off the beaten path places in Iceland as it’s located off the main road. You can get very close to the glacier front, even without any equipment. That’s quite an unusual stop, as it doesn’t have any natural landscape or amazing natural treasure. It’s a hill of the rock piles, located by the road. The history of it is quite an interesting one! More here. When arriving to the geothermal area of Hveragerði, you will see the steam coming from the hills and you will feel the earth boiling under your feet. It’s a special region in Iceland, and you can visit it properly the next day. Tonight, catch something to eat in one of the geothermal cooking restaurants or, if you travel Iceland on a budget, find a wild camping spot and cook something on the stove. The geothermal area of Hveragerði is a must stop on the Iceland road trip. The whole town is very unique, as you can find there the restaurants serving food cooked in the earth or vegetables that are grown with geothermal power. But the best part is the hike to the hot river hidden in the mountains. The water temperature in the river goes up to 40 degrees, and it’s a perfect place for a relaxing bath. 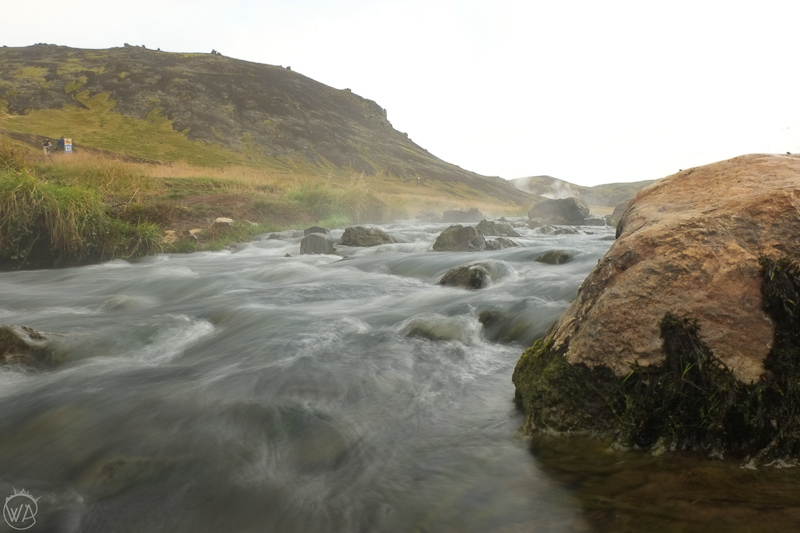 To get there, you need to follow the Reykjadalur hot spring trail for around 3,5 km, which will lead you through the geothermal area with bubbling hot springs and mud pots. 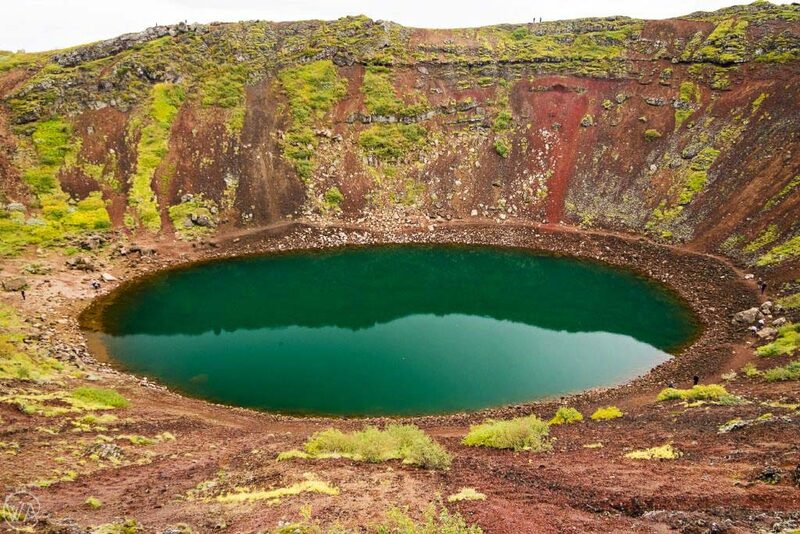 Kerið is a big volcanic caldera now filled with water, reflecting the surroundings in the summer and frozen in winter. There are great views from the top and you can also go down to the lake to feel like almost inside of the volcano. We didn’t see many people around, however, there is an entrance fee of 400 Icelandic kronas. 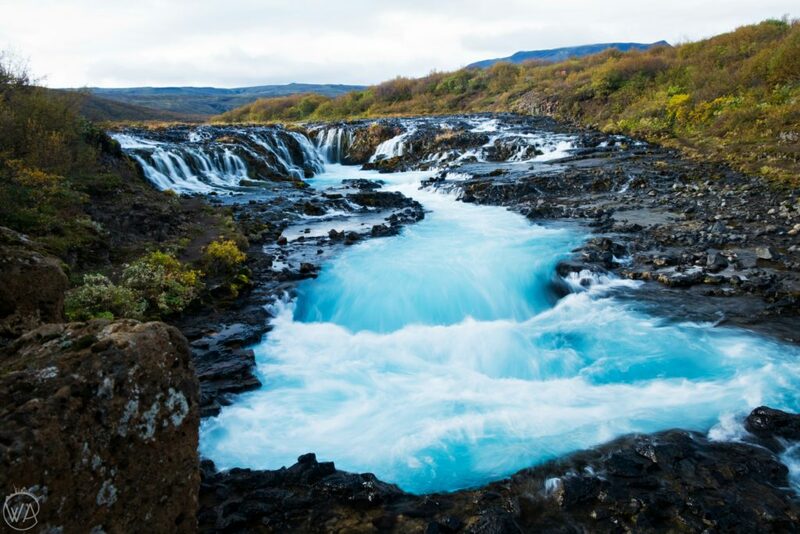 The waterfall with a milky blue water is one of the Iceland hidden gems. It’s so hidden, that we had some problems to find it but if you follow the link, I explain how to get there. 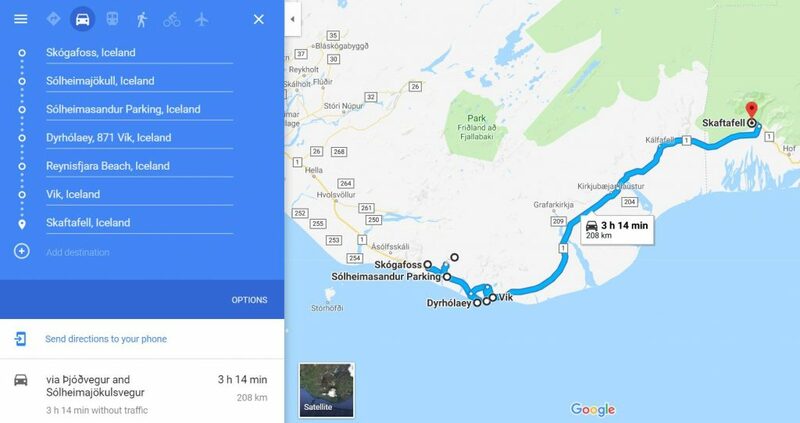 Congratulations, you just finished your 7 days Iceland road trip itinerary! I hope you enjoyed your time in Iceland. In your last hours in the country, you can chill in the Reykjavik cafes or stop by the Blue Lagoon on the way to Keflavik airport, where you can also drop off your rental car. 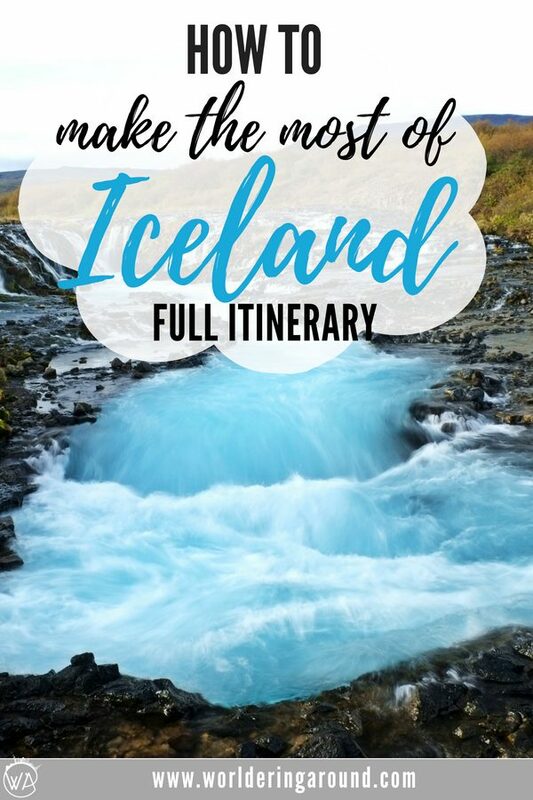 The Iceland travel itinerary, that I showed you above, is fully adjustable, so you can spend more or less time in some locations or skip or add some more. I hope it was useful for you to plan your Iceland trip. Iceland is an amazing country and I think that you can easily spend there a month exploring everything, not only a week. That being said, I will definitely come back and maybe also explore Iceland in winter. Have you been to Iceland before? 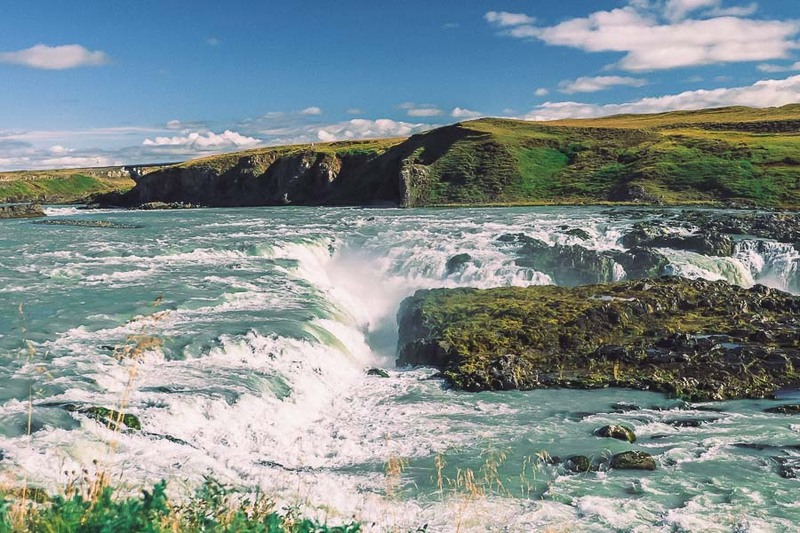 Would you like to spend one week in Iceland with this itinerary? Or maybe you have some other suggestions or questions? Let me know in the comments! Best Free Hot Springs in Iceland – visit the hot pools paradise! So how many days do you recommend to visit that part of Iceland? Hi Juan, if you are just focusing on the south part of the country, you can do it in 7 days, but obviously the more the better, as you can see places on the way, spend more time in the national parks, hike on the glaciers etc. As I mentioned in the post, even driving the whole Ring Road in 7 days would be possible – but then you spend most of the time in the car, which we didn’t want to do. For the ring road I would go if we had a minimum of 10 days. Do you want to drive around the whole country or you are just focusing on the south? Thank you very much for your answer!!! I’ll focus on the south. I’ll travel alone at the end of september. I think I’ll spend 6 days in Iceland (but I’ll spend one day in Reykjavik)…. I hope I can see the Northern Lights!!! If you have any other questions, don’t hesitate to ask! I’m from Argentina, too far from Iceland (despite our “Patagonia” is quite similar), so your help is really welcome! I plan to make a similar itinerary of what you have described. As I told you, I think I will rent a car to spend 4 or 5 days in the south of the island, to visit the main tourist attractions. I have some doubts about accommodation and car rental. I plan to rent a room (it could be a shared room in a Hostel, but I think I don’t want to sleep in a tent, or in the car). ¿Do you think I should make reservations in advance of the trip? ¿should them be in Vik and Hofn? ¿Do you think “Budget Cars” is the best option to rent a car? They have offices in the center of Reykjavik, right? No problem! At the end of September you shouldn’t have big problems with booking accommodation, but there is no harm in booking in advance, so you know you are safe. You can use booking.com as they have free cancellation on most of places. 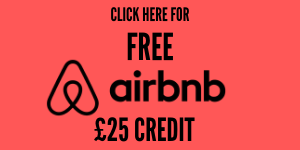 You can for example check places in the Golden Circle: http://www.booking.com/searchresults.html?region=14974&aid=1293006&no_rooms=1&group_adults=1&room1=A. Or stay every night at a different place. When we were in Iceland, we just stayed one day in the Guest house (here:https://www.booking.com/hotel/is/hafnarnes.html?aid=1293006&no_rooms=1&group_adults=2&room1=A%2CA ) and we booked literally less than an hour before arriving, because the weather was bad and we didn’t want to camp. We used Budget cars, because we found quite a good deal with them. But it is not to say that others are bad – you would just need to check many reviews before. I can say that we had good experience with Budget cars and no problems. Just follow what I mentioned in the post when you book the car and when you collect it. Make sure that it’s relatively new and report all the possible scratchings in advance. They have office just at the airport in Keflavik. 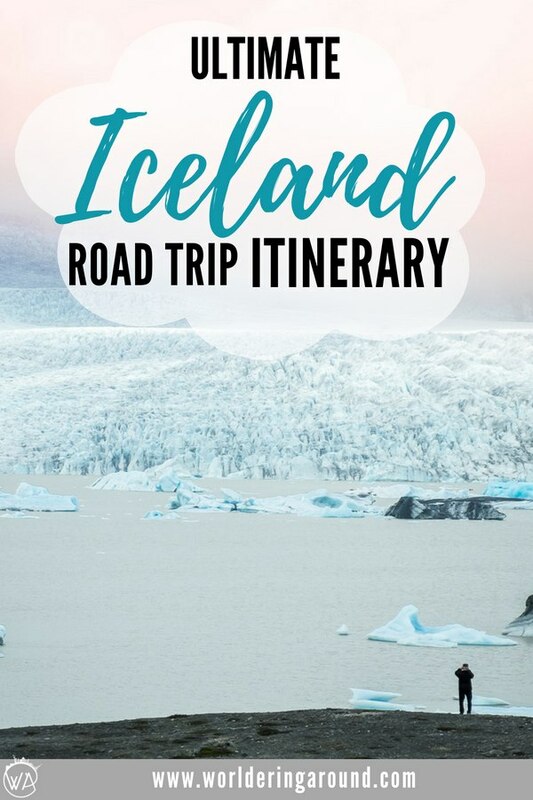 Even though I’ve been to Iceland, this road trip is one of my dreams. This was awesome and so detailed! I didn’t know about the plane wreck. Thanks! Great resource, Iceland is on our list and we LOVE to roadtrip, will save link for when we go. Looks amazing! Wow! Your photos are stunning!! Iceland has been on my list for so long and this trip sounds like a dream come true!! Iceland is on my bucket list for a while now and reading your post made me realize that it is a great road trip destination, Aga. I loved your itinerary and I hope I’ll get to use it soon. Are seven days enough to see all of the highlights Iceland has to offer? The longer the better, but in 7 days it’s possible to see most of the places in the south. Reykjavik has pleasantly surprised me and my friends. The city is quite large, so if you arrive from afar I advise you to rent a car. The city is very clean and here are friendly people.